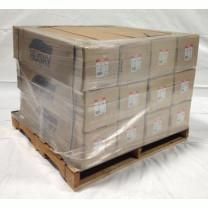 Husky Shrink Wrap is made in the USA by Poly-America from a specially formulated, virgin resin blend that provides superior strength and longevity to competitive films of greater millage. Husky shrink wrap comes in white, blue, and clear with a wide variety of roll widths ranging from 12' to 50' and is ideal for use in shrink wrapping boats, industrial equipment, construction and transporation applications and more. If you're unsure of which roll is right for the job, don't hesitate to give us a call today at 800-847-5290; with 25+ years in the business, we can give you expert advice!